The Definitive Book Of Body Language is a comprehensive guide that helps readers understand the dynamics of body language so that they can be in control of any situation that they encounter in their day-to-day lives. Summary Of The Book The Definitive Book Of Body Language is a book that contains detailed and invaluable information about body language. The book has been written by the best in the business, and is presented in a very entertaining manner. It is common knowledge (and scientifically proven) that non-verbal gestures play a much more important role in social interaction that verbal ones do. But very few people actually know how to interpret these non-verbal signs. Through their book, the authors seek to help readers use their knowledge of body language to confidently hold their own in any situation. The authors state that very often, what people say is quite different from what they think or what they feel. This makes conversations frequently confusing to decipher. To counter these disparities in thoughts and words and understand what is really being said, the secrets of body language revealed in this book can prove to be extremely useful. It provides techniques to learn how to read between the lines and interpret non-verbal cues correctly. The book stresses on the fact that human behavior must be observed in clusters, i.e. gestures must be interpreted in relation to one another and not in a standalone manner. Some of the useful scenarios explored in the book include creating a positive impression on people, presenting a pleasing, approachable personality, conducting successful negotiations and interviews, getting people to cooperate, and even figuring out if someone is available. Through the techniques outlined in this book, readers can also learn to recognize power plays, love signs, and deception. Interesting concepts like micro expressions, mirroring, arm positioning, and eye signals are also discussed. 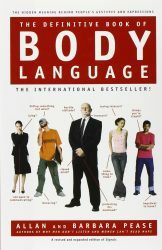 The book was first published in 2004, as a revision of the 1981 book, Body Language. This particular edition of the book was published in 2005.